We are passionate about fine jewelry. ​From the moment a precious gem is selected to its final setting when it achieves maximum perfection, we look at every relationship with a jeweler, a manufacturer, a buyer, a retailer and a customer, as a unique opportunity and a fulfilling journey together. Ask us how we can help you revitalize or prepare your fine jewelry for retail success. 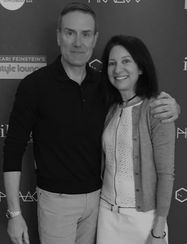 ​Jeff and Isabelle handle specialty retail management and representation for fine jewelry companies and offer customized marketing services including jewelry influencer affiliations, press relations, celebrity accessorizing, stylist collaborations, award show VIP suites and editorial content development. We work directly with the buyers at Bergdorf Goodman, Neiman Marcus headquarters in Dallas, The Wynn in Las Vegas, London Jewelers and Jeffrey's, as well as other independent jewelry stores across the country. Our network also includes Saks Fifth Avenue, Bloomingdale's and Barneys, as well as Starboard Cruise Services which handles on board retail for cruise lines including Norwegian Cruise Line, Silversea, Royal Caribbean, Holland America Line, among others. We visit the buyers in their offices around the country, as well as make frequent visits to local stores, as often as two times a month and have a very clear idea of what is selling, what their customers want and how engaged the staff is at selling our clients’ jewelry. We also train the sales staff and handle any issues that come up regarding returns, repairs and special orders. We are the liaison between them and the jeweler we represent, acting as both the sales agent and hands on representative. We develop programs based on how much can be manufactured and consigned at these stores. For jewelry companies seeking to revitalize or streamline their collections and operations, we offer a first-time audit and presentation to determine what jewelry will work for which retailer. Our management fee is a monthly retainer fee. We do not work on commission. As a result, we become part of your DNA which enables us to become 100% involved in your operations, working together to achieve sales and success, and open doors to a myriad of opportunities. ​Isabelle Kellogg met Jeff Koch at the French heritage jeweler Mauboussin where Isabelle was their PR Director and whose boutique on Madison Avenue closed in 2014. They decided to join forces in 2015 to maximize their global network of professionals in the fine jewelry business and bring a fresh perspective and a new level of insight to the jewelry retail community. Isabelle Kellogg has held in-house marketing and public relations positions for global luxury brands as Mauboussin, DeBeers/JWT and Chopard, as well as senior executive positions at LaForce & Stevens, PT&Co., and Manning, Selvage & Lee. Her work on the editorial side of the media world brings added value. She is the Luxury Editor for Cottages & Gardens publications, a reporter for thejewelleryeditor and a travel writer for The Epoch Times Canadian and US editions. She is also a guest lecturer at Harvard Business School for their MBA program on Luxury Marketing, giving the case study on Mauboussin. Looking for celebrity endorsements? We partner with bluPRint, our West Coast affiliate office in Beverly Hills, on strategic partnerships, editorial visibility, celebrity activations and award show gifting suites to give you that extra dose of star shine and sizzle.